Oh the lovely things: Geometry is fun! I already featured Depeapa's work a little while ago (here), but she's one of these über talented artists I would like to feature over and over again. 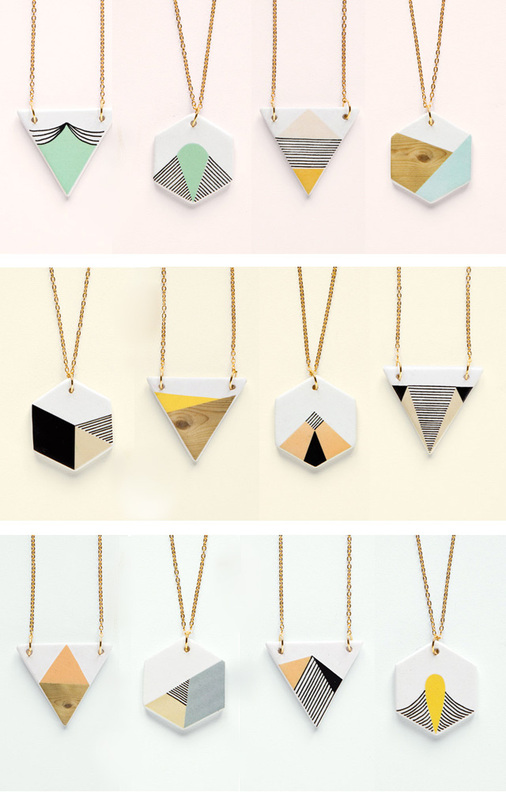 I just couldn't resist the urge to share with you her new "Geometry is fun" collection of ceramic wearable pieces. I don't think the shapes and color palette of these handmade necklaces and brooches could be any better! Check out the full collection here, and see more of Depeapa's work on her website, her Etsy shop, or her Flickr stream. wow, these are really cool. Haha I've been wondering why you use "über" in your sentence until i found that you live in switzerland. These with the wood details are my favourite! i agree with "they call me debbie" the wood bits are adorable, but totally love them all! these are absolutely gorgeous. i love the colours used, and the wood grain looks so cute. Wonderful!! I love the hexis the best. I have a mild hexi-obsession currently. I saw this post on Pinterest and LOVED her shop and had to buy one..